Winter Solstice at Muir Woods. Muir Woods National Monument, California. December 21, 2007. © Copyright G Dan Mitchell – all rights reserved. Depending upon the weather, this could be a good day for SF Bay Area photographers to combine winter photography at Muir Woods with a bit of night photography. Celebrate the longest night of the year with the tallest trees on earth! This outdoor program is suitable for all ages and will begin at the Visitor Center…rain or shine. 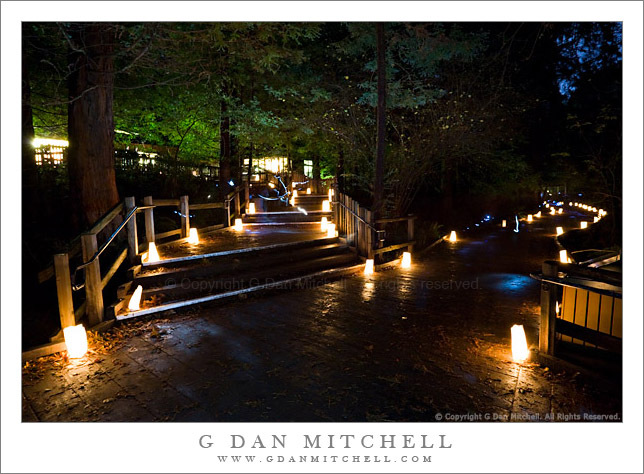 Activities and events include the making of solstice crowns, a stage performance of songs, stories, and puppetry, and walking the trails of Muir Woods lit by luminaria. No reservations required. This evening can be dark and chilly; we ask visitors to bring a flashlight, dress warmly (layers/blankets), and bring a mug for warm drinks. For details, please call the hotline at (415) 388-2596 as the date approaches. Unless the weather is really, really awful I plan to be there. The autumn color season in the Sierra Nevada should start very soon. Actually, if you count – as I do – the dry grasses and the high elevation ground plants going dormant, it has already begun. But the real show is the turning of the aspens, mostly in the eastern Sierra, starting around the very end of September and likely peaking during the first week of the month. If conditions are right, it can last as long as the middle of October, but earlier is always better. Several web sites have posted fall color guides in the past, and since timing is so critical it is a good idea to follow the as the time approaches. One site that is new to me is a US government site that reports on fall colors nationwide. Another that I’ve often followed in the past is the California Fall Color site, though it doesn’t (yet) appear to be active. In addition, I’ll summarize what I know and what I hear about Sierra fall color once the curtain begins to rise on this year’s show. Correction: I just saw that the road did not open today… It will apparently open on WEDNESDAY. Sorry! I discovered something interesting last weekend. I thought that the road, while open for administrative traffic ahead of time, was simply closed to other traffic until the entire thing opened. I was surprised to see a sign about a mile up 120 from the turn off in the park late last week stating “Road Closed 19 Miles Ahead.” I guess it may partially open a bit earlier than the full opening. "The Grand Register of Yo-Semite Valley"
Yosemite National Park received a treasure out of its own past Friday when philanthropist Bill Lane presented the park with the original “Grand Register of Yo-Semite Valley” at a small ceremony at Stanford University. …The signing began in 1873 and continued until 1884, and the book contains more than 18,000 signatures, including those of four U.S. presidents: Ulysses S. Grant, Rutherford B. Hayes, James Garfield and Theodore Roosevelt. Roosevelt got special treatment. He visited the park in 1903, long after the register was closed. Roosevelt didn’t visit the Cosmopolitan; he made a point of not entering a building, except to drink a lemonade at a studio in the valley. Instead, he went camping with John Muir. See the article for more information and some photographs. Groundhog Day Invitational pix. We hiked four hours along the misty ridges of Las Trampas Regional Wilderness, just up the road from San Ramon. Mount Diablo poked above the mist like the Kilimanjaro wannabe that it is. Temperatures, mild; winds, just enough to dry the sweat. In any case, it was a great hike, and I really want to get back to that park again on a very clear (unlike this weekend) day in spring since this seems like a park with excellent view potential. A highlight of the day was meeting 4WheelBob, whose goal is to reach to the the summit of White Mountain, which is over 14,000 feet. He’s been close a couple times, maybe 2007 will be his year.